'In my city there were seven men who wore bowler hats. They always went about together. They were serious, stuffy, wore only black and twirled their moustaches. Until one day the wind swept one of the hats far, far away and showed them something new.' Seven Men in Bowler Hats is a story to make us think, laugh and reflect. It takes us to that place where all of us should go from time to time: to the unknown, so that we can learn to value the small things that surround us and to which we tend not to pay much attention, but which we need, day after day. 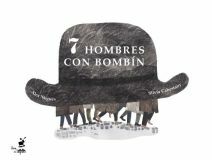 From the pen of Alex Nogués and with illustrations by Silvia Cabestany, we enter into the lives of those seven stuffy men, with twirled moustaches, who always wear black: those seven men in bowler hats.